More than a fifth of motorists have suffered car damage from a speed hump, according to a new report from Confused.com. The insurance comparison specialist polled 2000 drivers and found that 22 per cent had experienced damage to their car when passing over a speed hump, with the average cost of repair coming in at £141 per vehicle. Almost half of car drivers claimed that a speed bump had caused damage to their tyres, while a third said it broke or damaged the suspension. The survey found that more than a quarter of drivers want markings on speed humps to be made clearer, while one in four argue that they are not an effective method of reducing speed. A freedom of information request by Confused.com found that local councils have forked out more than £35,000 to drivers for harm caused by speed humps between 2015 and 2017. Highways Regulations state that drivers may claim for damage to their vehicle if the road surface is defective. However, speed bumps and humps are not technically classed as a ‘road defect’, which makes it difficult for drivers to make a claim. "Claiming for damage to your car caused by speed humps is confusing for drivers. Unlike potholes, which are defects in the road, speed humps have been installed for safety"
But there are limitations on how big a speed hump should be, and this might make it easier for motorists to claim compensation for damage. According to the Highways Regulations 1999, road humps should not exceed 100mm in height. Anything higher than this is more likely to cause damage to a car, and puts motorists in a position to claim for damage caused. The government recommends they are no higher than 75mm. More than 29,000 speed humps, bumps and cushions are installed on UK roads; however, the research from Confused.com found that a quarter of drivers think these measures are ineffective - with one in six saying speed cameras and chicanes are far more useful. "Claiming for damage to your car caused by speed humps is confusing for drivers. 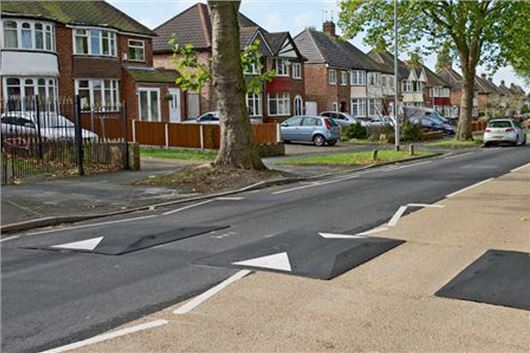 Unlike potholes, which are defects in the road, speed humps have been installed for safety," said Amanda Stretton, motoring editor at Confused.com. It’s not just the speed bumps or humps, it’s the potholes and sunken roadway surrounding them especially on the down side making the bounce even heavier. My car was serviced at 60k in Sept 2016, MOT on the Friday, 250 mile round trip inc 70mph on the A9 dual carriageway on the Saturday, so you’ve guessed it – 50 yards down the road on Sunday and the first speed hump broke the front right spring. And no, it wasn’t £141 for two new front springs and mountings either, a lot more than that from the Main Dealer. Fortunately no tyre damage, but new shock absorbers required in the next six months. As a responsible motorist / human being, I'm in two minds about speed humps as humans have been trying to perfect roads since the Romans, then these come along and damage people's cars, even when tackled slowly. But as there are a huge number of irresponsible people on the roads, they seem like a necessary evil in places. For example a lot of vehicles speed into a blind corner on my road, hence why there have been several serious accidents. We have moped / motorbike riders charging about with noisy exhausts into the early hours too, so maybe speed humps might slow those inconsiderate, selfish people down a bit too, or put them off driving around and around and around for the sake of it. But what I can't understand, along with forward facing speed cameras that don't pick up speeders on two wheels, is why councils use the kind of broken speed humps as in the picture because I'm regularly tailgated by vans who easily pass over these kinds of speed humps as their wheels straddle them without impact, so they expect you to travel 20 mph over the speed limit with them. And some motorcyclists just charge between them, reliving the TT races. All a bit rubbish really like most poorly thought out / executed schemes. Speed bumps also cause serious back injuries to drivers of buses, dustcarts and the like who have no choice other than to drive over them on their daily routes. Ambulance, police car and fire engine drivers often have no choice of route, either. And patients in ambulances - as well as countless patients with all manner of injuries and ailments, operations, etc., being driven in taxis or private cars - suffer terrible pain and worsening of their conditions. Add to this the proliferation of idiotic bling-bling wheel/tyre combinations and it's a perfect storm. We have a far greater than average proportion of speed humps where I live & mostly on quite a bendy road. This road has been there for over 100 years, why just now does it need humps every 30 yards. Very dangerous with cars weaving side to side trying to avoid the worst of the humps. White van man doing similar at twice the speed. Young chavs in their Corsa's hitting them at high speeds thinking it's fun to take off on the humps. The odd caravan tower driving the full length at 8mph resulting in impatient or late drivers overtaking in dangerous places. Madness. I can only assume some idiotic Councillor lives on the route. and the other major problem is the significant additional pollution emitted as vehicles slow down then speed up again. The madness is that much of this pollution is outside schools. I consider myself a safe, speed awareness and considerate driver, but speed humps really annoy me for three reasons. One, the humps themselves are not really wide enough, so if you have a large car, van or bus etc, these vehicles can simply straddle the humps so they don't need to slow down at all. The second reason is that they slow down the wrong vehicles. Drivers like myself have to slow further down unless I want my spine to jump up and rattle my eyes! But mostly 'young and middle-aged' drivers simply don't appear to 'see' them and race over them at speeds far in excess of the designated speed limits. My third reason is that the emergency services are slowed to such an extent that I have seen many times a blue light ambulance crawl over each hump, as they are obviously carrying a very poorly patient. The fire brigade is also slowed considerably. Now it might be my or your mother in that ambulance which is forced to travel slowly over those speed humps and you want it to reach hospital as quickly as possible. Same with the fire brigade. Again that may be my or your house that is on fire and you want them to arrive asap. You don't want them having to slowly negotiate their way over an obstacle course before they can reach you. They were designed obviously to slow down drivers in such place as approaching schools, on housing estates and any other road that the police and councils consider that drivers simply drive too fast. But what do they really do? Well as I never drive fast over the speed humps I can't honestly say they do any damage to my car. But that's because I drive very slowly over them. Do they slow me down? Certainly. Blasted things! It's not just poorly patients. In many ambulance calls, the second paramedic in the back might be injecting the patient or using some medical device, bumping is not advised in such circumstances. Around here (East London) the location of speed bumps seems random, on the approach to a school from one direction, but not the other. On bus routes, yet not on side streets used as 'rat runs'. I'm convinced the popularity of 4x4 and SUV style vehicles is because the increased suspension travel eases these bumps. Please make councils responsible for the dangerous manner some bigger vehicles ie refuse lorries and builders supply lorries take no notice of 20 mph limits without speed cameras! it's all self inflicted due to nothing more than the desire to get from one point to another in the shortest time possible. The more advanced or prestigious the vehicle the more retrograde the clown holding the wheel usually is. Took a ride with a friend who clouted a speed bump in which i felt the impact, did it stop said friend from carrying on....No not a bit of it, might just as well not been there but I knew that the tyre has suffered a major impact as had the alloy wheel so i don't bother asking for a lift as I value my life. Said friend will one day soon suffer a heavy impact as their driving is atrocious and getting worse ( too much speed on inappropriate areas especially built up areas, too much late braking in the manner which snaps your neck and makes for an uncomfortable ride ), saying anything will have no result either as they think they are the world's greatest driver and be told. That said given the general poor state of all our roads in the UK what do you need speed bumps for anyway, its all the potholes craters and crap repairs when utilities fools have dug the road up and relaid it in a poor fashion. One piece of Dual carriageway road along the A41 towards Aylesbury is so P**s Poor it throws you around like a pea in a pod AND that's after the road was last relaid not more than a year ago.
" if the road surface is defected" - defective grammar! the local playpark was dismantled and taken away by the council, as it was being vandalised. Dont prosecute the vandals make the kids pay. !!. It is an offence to break the speed limit. Dont prosecute the speeders make all motorist pay by introducing humps to damage cars. Cant take my dog on the beach because some people break the law by not picking up their dogs mess. Dont prosecute the offender make everyone suffer. What happened to law and order, simple stop everyone from doing anything that may break the law as there is no will from the Govt for policing, they will be locking us all up soon to prevent crime. It would be funny if it wasnt true. There are humps near me that are outside a school, I slow down to ensure that I very slowly roll over the hump to avoid damage. The amount of drivers following behind that get totally obnoxious because they have to slow down is amazing some even attempt to overtake at ridiculous speeds just to gain a few feet. These are the people that have the insurance claims and I for one would not honour the claims, as they are speeding and responsible causing the damage. You don't have to be speeding to incur damage from a speed hump. If the limit is 30 Mph then the speed humps should be so designed that one can drive over it without damage to your vehicle at the posted limit. If that is deemed too fast for a particular area then do the job properly and lower the posted speed limit. Don't do it by the back door and put an an obstruction in the road which often forces vehicles to take up a less than ideal position. That said, is not the speed bumps per se it is due to their poor design and being done on the cheap. Furthermore if you look at a pothole I can guarantee that a lot of the time it is a result of the original road surface being disturbed. This includes not only speed bumps but anti skid surfaces, road works etc. All done on the cheap. In view of the appalling state of Britain's roads can I have some of my road fund licence back please? All of the above comment are correct they should be highlighted so that they can be seen, Currently you are in many cases only aware of them when exceedingly close to them. Not only do the damage the car they also cause excessive wear on the inner walls of Tyre`s. This in turn can lead to accidents. Don't drivers understand that they themselves are to blame for the speed bumps. Thousands of pounds have been spent on the estate where i live for signs and bumps to bring the speed limit to 20mph and it has made no difference. Many many years ago my driving instructor told me there is no such thing as a speed limit "YOU DRIVE TO THE ROAD CONDITIONS"